Evidence for Democracy is a non-profit organization that advocates for the use of evidence in government decision-making. It was created by Canadian scientists and science communicators concerned about federal cuts to science and limits on communication of publicly-funded research. 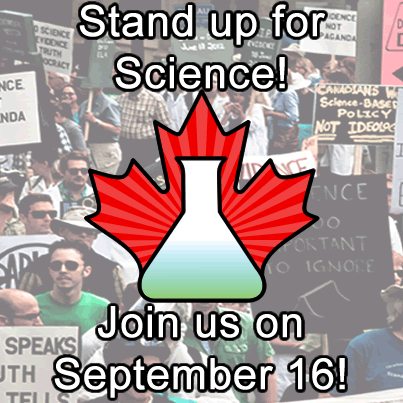 Evidence for Democracy is holding Stand Up for Science rallies across Canada on Monday, September 16, 2013, including one in Ottawa on Parliament Hill from noon to 1:00 p.m. Many more examples are at http://scienceblogs.com/confessions/2013/05/20/the-canadian-war-on-science-a-long-unexaggerated-devastating-chronological-indictment/. Details on Stand Up for Science are available at Evidence for Democracy’s website and on Facebook.